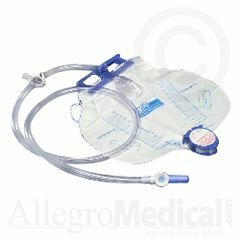 The Curity Drainage Bag is a 2000ml drainage bag with drip chamber, needleless sample port and universal hanging device. Please note that Covidien is currently standardizing this product under the brand of "Dover". Until inventory is cleared from the channel the brand on the packaging may be Kendall, Curity or Dover. All products inside of the packaging are the same thing and same manufacturers part number. We apologize for any inconvenience that this may cause. Great splash guard, easy to use. I ordered 2 of these bags to try them because the reviews were so good. Nope, shouldn't have wasted my money!! Both bags leaked from the bottom somewhere, from the valve I think. Got urine all over. It was a slow leak, but it still leaked. :( I thought maybe it was just the one bag, since everyone else reviewing these likes them. Nope, both bags leaked. I would not recommend wasting your money on these. Also the "anti-reflux" valve didn't work on either bag. The urine easily flowed back into the tubing after it was already in the bag. Works great. Works great. Works great. Sturdy. Sturdy. Safe. Easy to use. Drains quickly. As stated above, it is simple to use, drains quickly, well made....wouldn't use anything else. Sturdy. Great valve. Great drain valve. Safe. Elderly. Following Surgery. Bladder Problems. Bag easy to drain. The chamber never clogges. how to get a clean catch specimen? How long can I use the same catheter bag? I am new to these products. They placed my husband on a condom cath and I need to get a new drainage bag. Will this work with a condom cath? This works very well with a condom cath and is easier to empty. The Curity Bedside Bag works very well for me. I am very pleased with it. Yes it will work with condom cath. loop excess tube on bed and clip it to the sheet to keep from pulling. This should be answered by the husband's physician. But there ought to be no reason that it will not work. I just want to thank your customer service dept for the prompt service in getting a pick up for the items that were delivered in error and re-sending my order. I received the correction today. Great, efficient customer service! Thank you.